WASHINGTON (Reuters) - U.S. Secretary of State Mike Pompeo urged Myanmar's government to take concrete steps to investigate human rights abuses against Rohingya Muslims and hold accountable members of its security forces and others for any involvement in those actions, a State Department official said on Friday. The State Department report issued earlier this week accused Myanmar's military of waging a "well-planned and coordinated" campaign of mass killings and gang rapes but stopped short of describing it as genocide or crimes against humanity. U.N. investigators issued a report in late August accusing Myanmar’s military of acting with "genocidal intent" and calling for the country’s commander-in-chief and five generals to be prosecuted under international law. 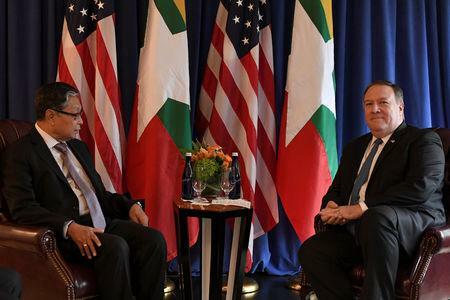 Pompeo "urged the government of Burma to take concrete steps to investigate the human rights abuses chronicled by the U.S. Documentation Report and UN Fact Finding Mission and to hold accountable members of the security forces and others responsible for these acts,” State Department spokeswoman Heather Nauert said in Friday’s statement.